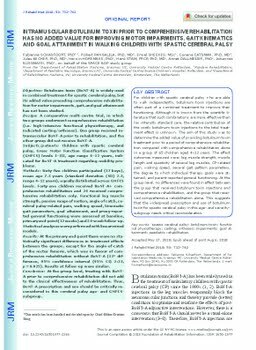 Objective: Botulinum toxin (BoNT-A) is widely used in combined treatment for spastic cerebral palsy, but its added value preceding comprehensive rehabilitation for motor impairments, gait, and goal attainment has not been studied. Design: A comparative multi-centre trial, in which two groups underwent comprehensive rehabilitation (i.e. high-intensive functional physiotherapy, and indicated casting/orthoses). One group received intramuscular BoNT-A prior to rehabilitation, and the other group did not receive BoNT-A. Subjects/patients: Children with spastic cerebral palsy, Gross Motor Function Classification System (GMFCS) levels I–III, age range 4–12 years, indicated for BoNT-A treatment regarding mobility problems. Methods: Sixty-five children participated (37 boys), mean age 7.3 years (standard deviation (SD) 2.3, range 4–12 years), equally distributed across GMFCS levels. Forty-one children received BoNT-A+ comprehensive rehabilitation and 24 received comprehensive rehabilitation only. Functional leg muscle strength, passive range of motion, angle of catch, cerebral palsy-related pain, walking speed, kinematic gait parameters, goal attainment, and proxy-reported general functioning were assessed at baseline, primary end-point (12 weeks) and 24-week follow-up. Statistical analyses were performed with linear mixed models. Results: At the primary end-point there were no statistically significant differences in treatment effects between the groups, except for the angle-of-catch of the rectus femoris, which was in favour of comprehensive rehabilitation without BoNT-A (12° difference, 95% confidence interval (95% CI) 2:23, p = 0.025). Results at follow-up were similar. Conclusion: At the group level, treating with BoNT-A prior to comprehensive rehabilitation did not add to the clinical effectiveness of rehabilitation. Thus, BoNT-A prescription and use should be critically reconsidered in this cerebral palsy age- and GMFCS-subgroup.